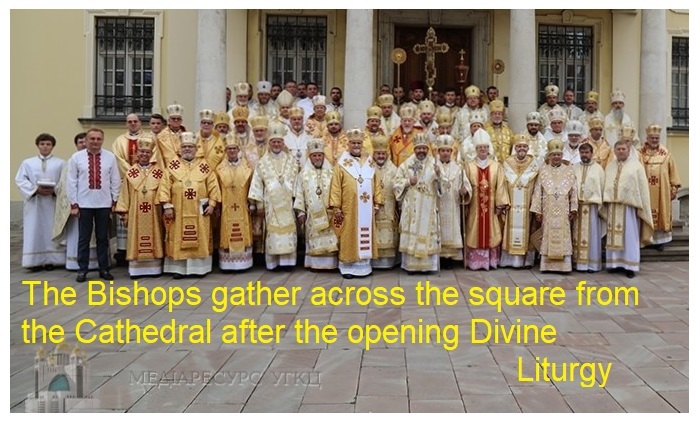 The Synod of Bishops of the Ukrainian Catholic Church began Sunday morning in Lviv, Ukraine with a hierarchical Divine Liturgy in the historic St. George’s Cathedral. At the majestic Eucharistic liturgy, presided over by the head and father of the Ukrainian Catholic Church, His Beatitude Sviatoslav, a new auxiliary bishop for the Archeparchy of Philadelphia was consecrated. His Beatitude Sviatoslav, Metropolitan Stefan Soroka and Bishop David Motiuk, as according to the Church’s ancient tradition, were the three consecrating bishops for Bishop Andriy Rabiy. During his homily at the Divine Liturgy, His Beatitude spoke about the newly-ordained bishop and about the theme of the Gospel reading on the parable of the vineyard (Matthew 21:33-42). However, his most emphatic moments were reserved to his call to prayer for this year’s Synod of Bishops.